Patient aged 13 years with a 33 degree left thoracolumbar scoliosis. This patient was 13 years old at the time of diagnosis. She had noticed her posture was off centre and was experiencing mild back pain. Sports participation included ballet, other dance styles and netball. The Scoliosis was diagnosed 4-5 weeks before the initial consultation at Sydney Scoliosis Clinic. The medical history was unremarkable with the neurological examination within normal limits. Birth and developmental milestones were within normal limits (as reported by her mum). There was tenderness to palpation of the spine at the Thoracolumbar junction. There was pain on left lateral flexion of the spine. The patients’ grandfather was diagnosed with Scoliosis. Initial X-rays showed a 33 degree left thoracolumbar scoliosis. There was also significant lumbar spine rotation on x-ray. The Risser sign on the pelvis was Risser 1-2, indicating that the patient was skeletally immature and more growth and progression was expected without treatment. As the patient was still growing, was a Risser 1 and the curve was greater than 30 degrees, there was a high risk of progression. A combination of a customised 3D designed rigid brace, scoliosis specific rehabilitation exercises and use of a scoliosis orthotic device were recommended. The scoliosis brace was to be worn full-time. This is 23 hours per day with extra time up to a maximum of 4 hours out of the brace if the patient was actively participating in sports during those out of brace hours. The weaning into the brace was started with 2 hours of brace wear on the first day followed by adding another 2 hours every subsequent day until the required full-time hours were attained. 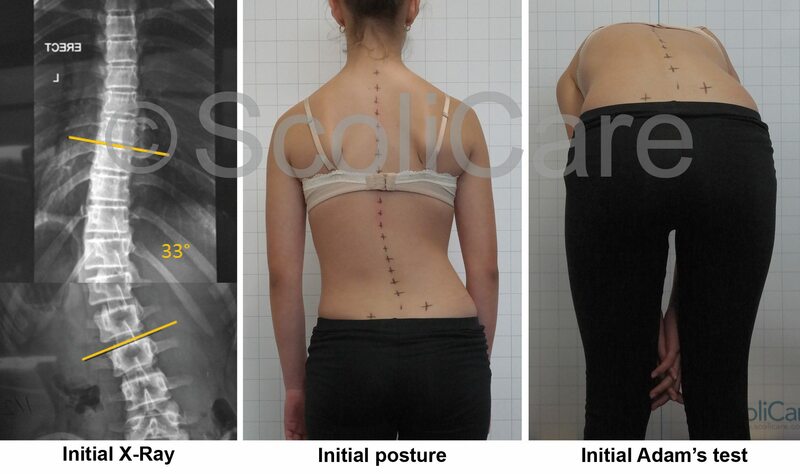 The scoliosis specific exercises were initially implemented as twice a week for 3 weeks, followed by once per month. The patient was required to complete the exercise protocol at home daily. A scoliosis orthotic device was also used daily for 20 minutes to stretch the spine at the Thoracolumbar junction. This device was placed at the left apex with the patient lying on her left side. Exercises were performed on the device. At the one month in-brace x-ray the curve had reduced to 13 degrees. At the 3 month out of brace x-ray the curve had reduced to 26 degrees. At this point extra corrective padding was added to the brace to increase the 3-dimensional corrective action of the brace. At the 12 month mark an out-of-brace x-ray was taken. The results of which showed that the spine was 11 degrees without using the brace. The last x-ray was taken 22 months after the start of treatment. This x-ray was an out-of-brace x-ray where the patient was required to be out of the brace for at least 6 hours. The results of which show her spine to have a 6 degree curvature, which according to definition cannot be classified as a scoliosis. 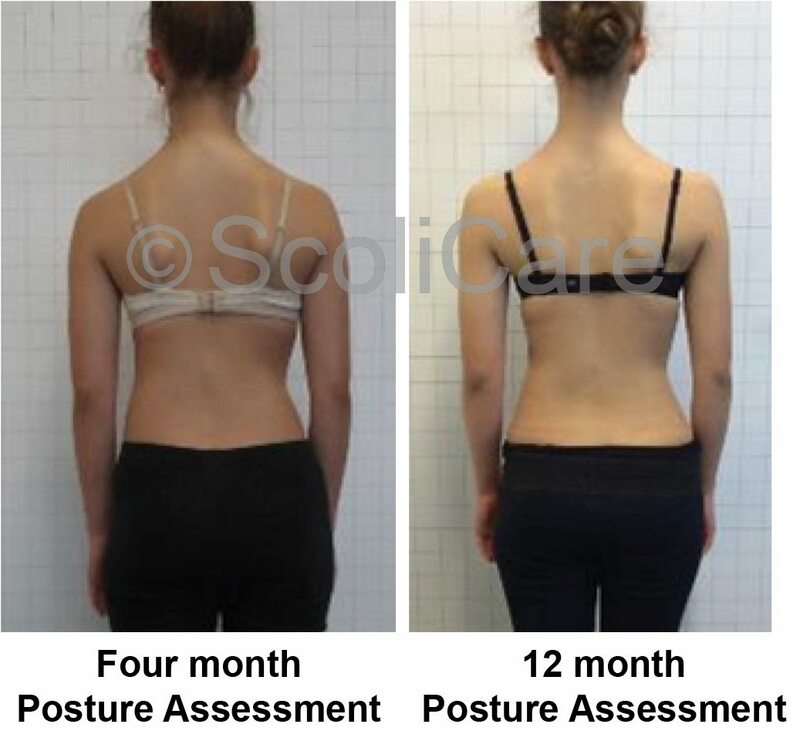 The postural assessment showed continuous improvements of her posture with her body showing good balance after 4 months of treatment to the point that she was symmetrical by the 12 month mark. The postural improvements have been maintained throughout the treatment period. The functional assessment of fatigue ability and strength of her core muscles, together with the flexibility of her spine showed no deterioration of strength, endurance or flexibility. A rigid custom designed 3D scoliosis brace, in combination with a scoliosis specific rehabilitation program, may achieve reduction in Cobb angle in similar cases. This approach follows the SOSORT criteria as was shown in the literature review to have a positive prognostic impact on Thoracolumbar curvatures. 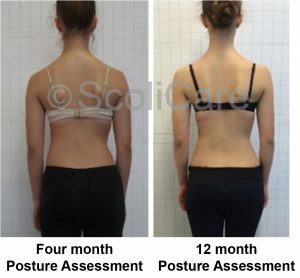 This approach is a team approach that allows the patient to learn a scoliosis specific exercise program, together with a bracing technique that does not use a 3 point pressure system, but rather is an over-corrective custom designed brace that is designed to address all aspects of the scoliosis from sagittal and coronal balance to lateral translation at the apex and vertebral rotation of the curve.